If you love the Roulette game, NetEnt has you covered as it has created European, American, and French online roulette games. The European and French versions are available on Bcasino.co.uk (Bcasino). It is true that all roulette variants have much in common, but there are certainly important differences. French Roulette from NetEnt is a faithful representation of the casino classic and is different from the company’s European and American versions. We will discuss those differences in this review, but the important thing to know is French Roulette by Net Entertainment looks amazing and plays even better. It is worth noting that NetEnt also runs a live version of French Roulette from its studios in Malta. This review is about the online video version, so we won’t go too deeply into the live version. That said, if you want an even truer classic representation of casino based roulette, this is an excellent option. It looks good, the audio is perfect, and there is no lag from the live stream. Bcasino tested this live version and it was hugely enjoyable. However, the French Roulette in online video form is also excellent and if anything, is a more relaxing version compared to the live variant. As usual, NetEnt has thrown the visual kitchen sink at this game and the result is a truly sumptuous looking roulette experience. The graphics are high definition and the colours are rich and clear. Of course, this is just a roulette game, so not much happens visually, but all the movements are perfect and we never saw a dropped frame. Because of the striking aesthetic, this feels like a real life French Roulette game. 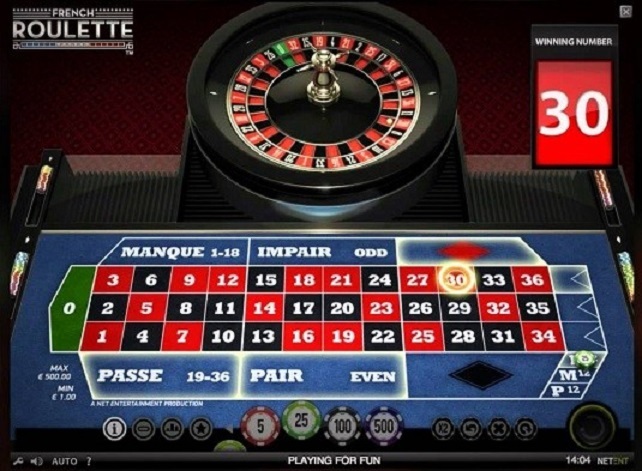 French Roulette is a single-zero 37 slot game that comes with a huge betting range and plenty of features. Navigating the opening menus and in-game settings is easy thanks to an intuitive UI, while the virtual voice announcer will guide you through the game. If casino vibes are your thing, lower the lights and settle in to a relaxing session of NetEnt’s excellent version. Naturally, there are some key differences between French Roulette and its European and American counterparts. In European and American versions, a player loses an entire bet if the ball drops on zero. For French Roulette, NetEnt uses a spread feature when landing on zero. This means half the stake is place on even-money wagers (Red/Black, Odd/Even and Low/High) if the ball lands on the zero. Using the La Partage rule cuts the house advantage to 1.35%. As mentioned, the game has a wide betting range. Users can bet anywhere between 1.00 and right up to 500 (Pounds or Euros). This means French Roulette is really open to all. If you are on a budget, you can still play and pick up wins. If you are a high roller, there is potential for massive bets and even bigger wins. As always, NetEnt has a ‘Play for Fun’ ability so you can just test the game out. At the bottom of the interface, there is a betting table that hosts the Manque, Impair, Pair, and Passe wager options. Roulette is a standard classic of casinos, so developers are reluctant to change a winning formula too much. That said, Net Entertainment has proven on other roulette games that it can add features that enhance the experience without changing what people know and love. This is encapsulated by a generous Autoplay feature, which allows 1,000 spins to be played automatically. It is possible to interrupt this autoplay run if you want to go back to manual wagers. The betting table below the wheel is blue, mimicking the classic cloth of a real casino. On the play table, users will finding familiar even spread bets like Red/Black, Odd/Even, 1-18, and more. NetEnt has included a Billboard feature which presents the numbers drawn through the last few spins. Using the Billboard, you can bet on numbers that have been landing hot or cold. Hot numbers are shown as the most common number drops over the last 500 spins, while cold are the least drawn. As we have seen in other NetEnt roulette games, there is a bet customization and saving tool. This feature removes the frustration of making complex betting patterns. If you are making complicated wagers or a high roller, the convenience of the templates and ability to save patterns is an invaluable tool. Roulette players will be familiar with the racetrack, which is available in French Roulette. The track lets you make actions, such as Call bets.